Hamas releases animated video calling on the "Zionists" to run away before they are run over by a car. 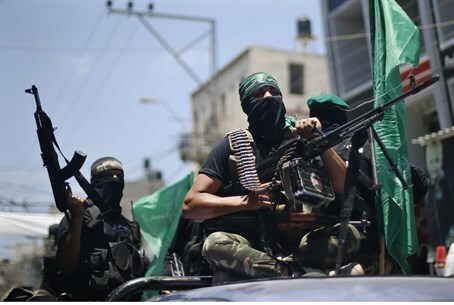 Hours after a terrorist attack in a Jerusalem synagogue killed five people on Tuesday morning, Hamas is continuing its incitement against Jews. The latest incident is an animated propaganda video, posted on the Facebook page of the Shehab News Agency, and which encourages car terrorist attacks against Israelis. Run away because you are about to die"
Animated videos are one tool among many used by Palestinian Arabs to incite to the murder of Israelis. In May, to mark Israel's Independence Day, Hamas released an animated video which featured an "alternative" to Israel's Hatikva national anthem, and which called for the ethnic cleansing of Israel's Jewish population. Many cases of incitement in the Palestinian Authority - both by Hamas as well as PA Chairman Mahmoud Abbas’s Fatah movement - have been exposed in recent years. These include the glorification of Nazism and the lionization of Adolf Hitler, as well as programs on official PA television featuring heavily-stereotyped Jews as villains (and encouraging violence against them), and various TV and radio shows which literally wipe the Jewish state off the map. Just last week, a PA newspaper featured a cartoon portraying Temple Mount activist Rabbi Yehuda Glick as a venomous snake. In a press conference on Tuesday following the attack in Jerusalem, Prime Minister Binyamin Netanyahu once again highlighted the incitement of the PA.
"Hamas, the Islamic Movement and the Palestinian Authority are disseminating countless lies and falsehoods against the State of Israel. They are saying that the Jews are contaminating the Temple Mount. They are saying that we are planning to destroy the Holy Places, that we intend to change the order of prayer there – this is all lies. These lies have already claimed a very heavy price," he said.